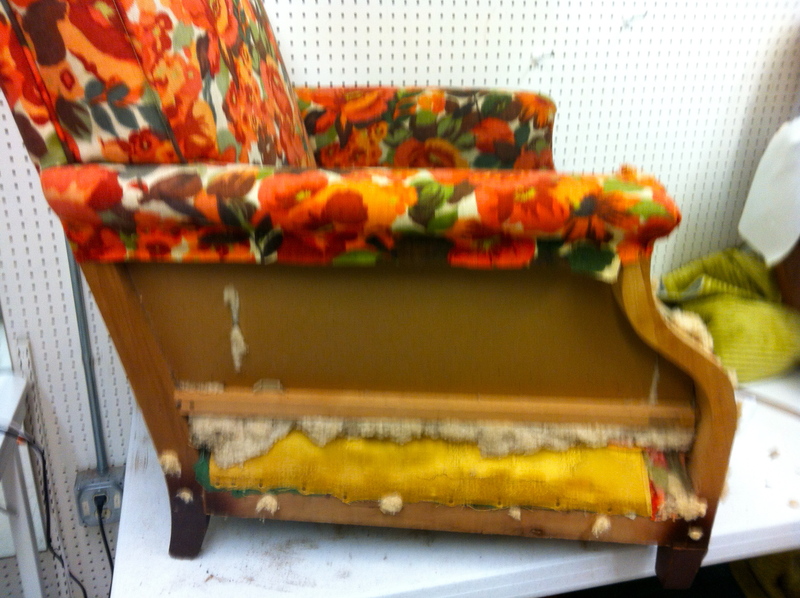 And another new project – UPHOLSTERY CLASS! Deciding it was time to stop saying I wanted to learn this and just LEARN it, I signed up for an upholstery class last week. 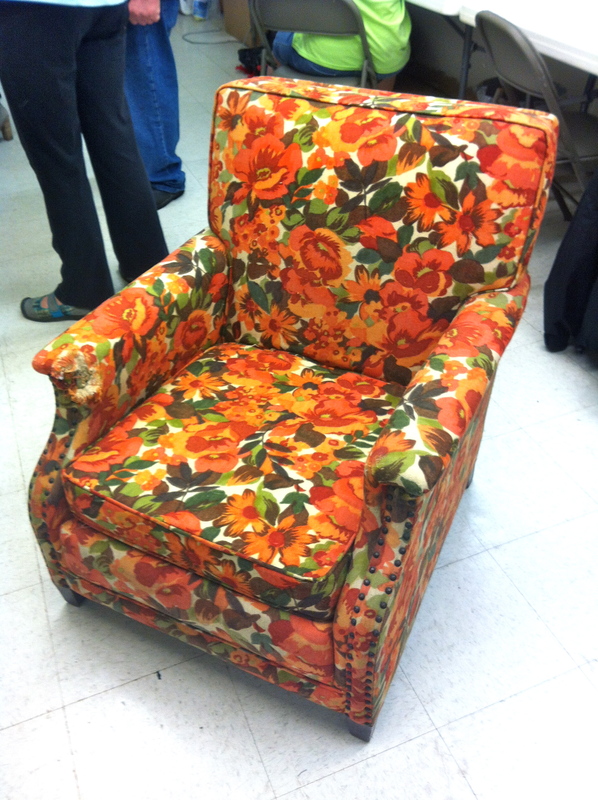 My choice for the class is a mid-century club chair that belonged to my grandmother. She had it recoverd around 1970 in an OVERSIZED floral print in three shades of orange with lots of avocado and celery green accents. It sounds worse than it really is, but dog chews to the arm, fading to the fabric and the overwhelming smell of cigarettes and wood smoke meant it needed a fix or a toss. I chose to fix it! Other than the instructor Ollie, I was the only guy in the class. 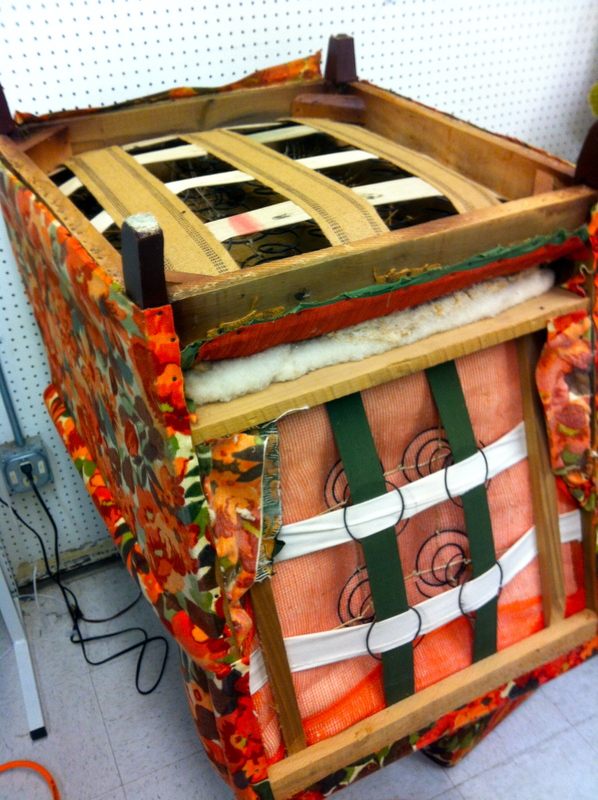 My fellow classmates had all taken the class before, so were far into the reupholstering process already – boy could these ladies use a nail gun! They were tacking, cutting, sewing and stapling like mad. The woman next to me said “I’m finishing this during this class or my husband says the damn thing’s going in the trash.” I could tell she was serious about finishing it. 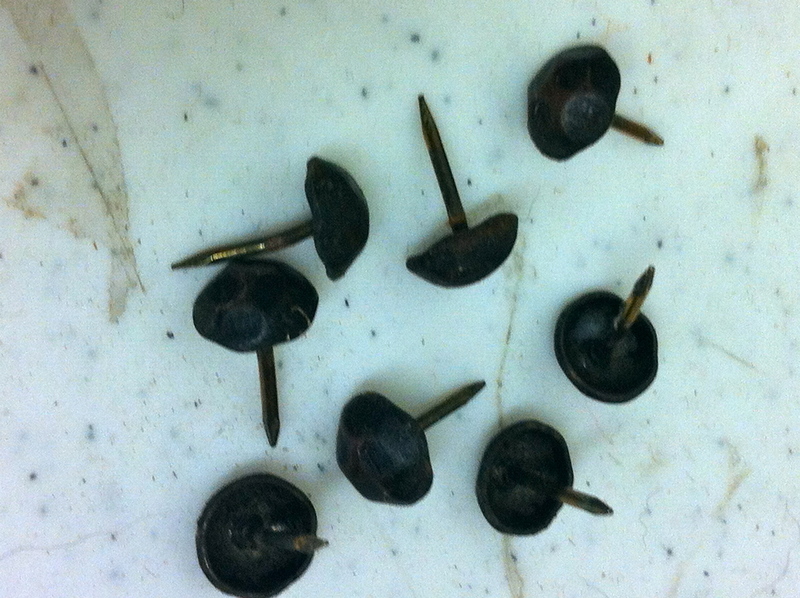 Since I was just starting, I spent four hours pulling upholstery tacks, decorative hammer nails and staples – and I didn’t even get the chair completely apart! There was a lot of dust and floating bits of old padding and foam in the air to go with it, and I was wishing I’d taken an allergy pill and worn a dust mask – there’s always class #2 for that, huh?. The chairs can’t stay at the class location, and as I had howmework – to finish ripping it apart – I loaded my chair back into the car to work on in the garage. My instructor said we’d be reusing some of the original padding, so I doused it with a lot of odor neutralizing spray that’s supposed to work on cigarette smell, but I don’t think they ever tested it on something as stinky as this! I’m leaving it outside to help with the de-smelling process. More pics and progress notes after this Thursday’s class…..